I am beyond excited to share my new project with you! 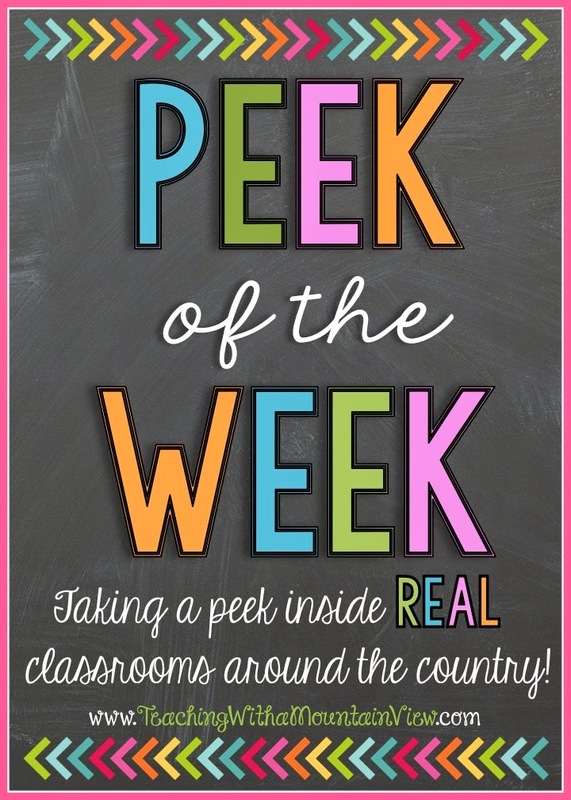 I am pleased to introduce to you Peek of the Week...a weekly peek inside REAL classrooms around the country! I came up with this idea after realizing that I spent way too much time snooping on my teacher friends' classroom pictures. 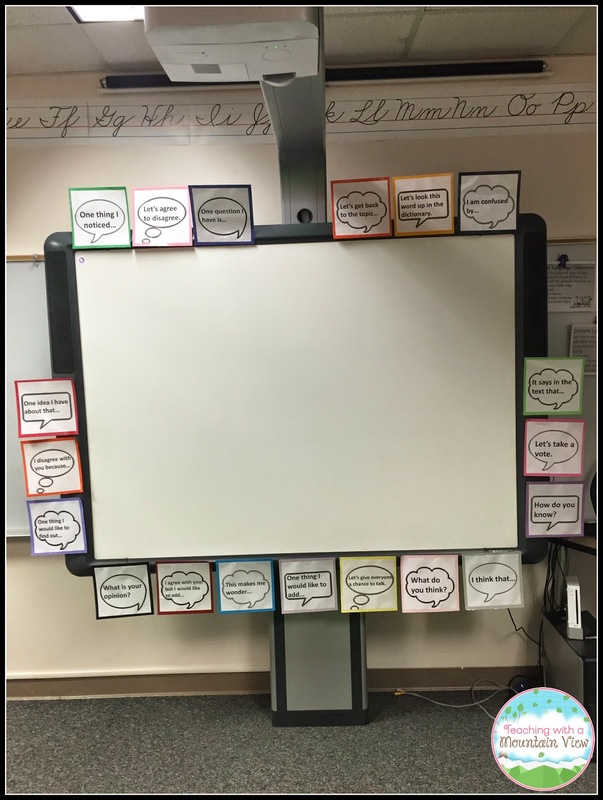 If they posted any on Facebook, I would zoom in and look all around their classroom, trying to pick up a new idea for my own classroom. 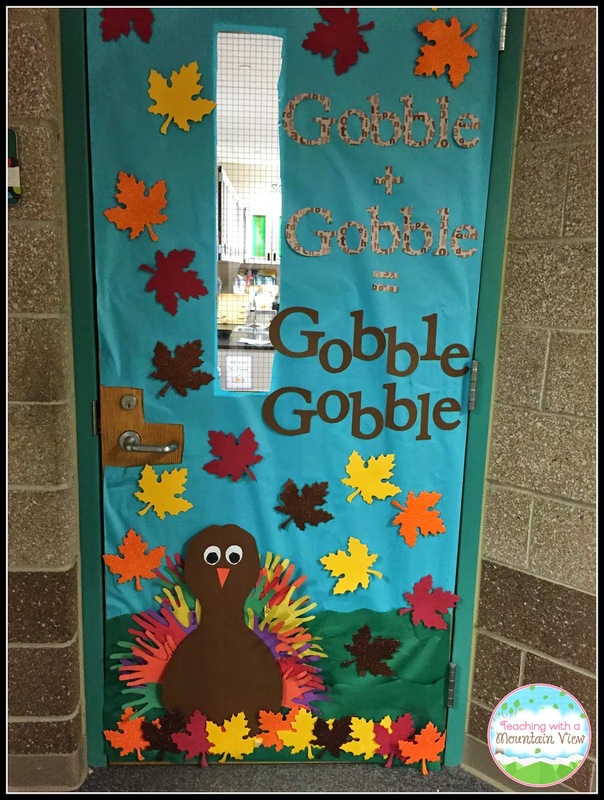 It brought me back to when I first started teaching and I was always scouring the Internet for ideas on decorating classrooms. 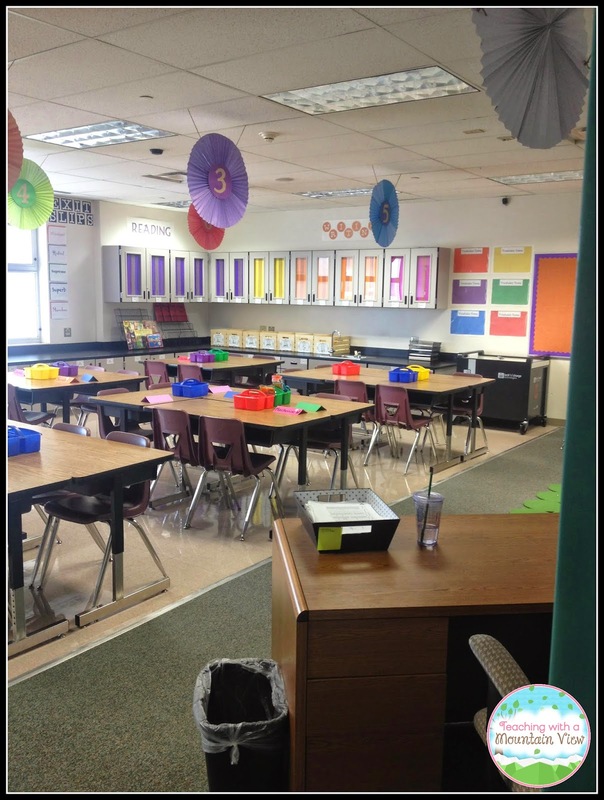 I just absolutely love seeing inside other classrooms! I don't think I'm alone in this desire. 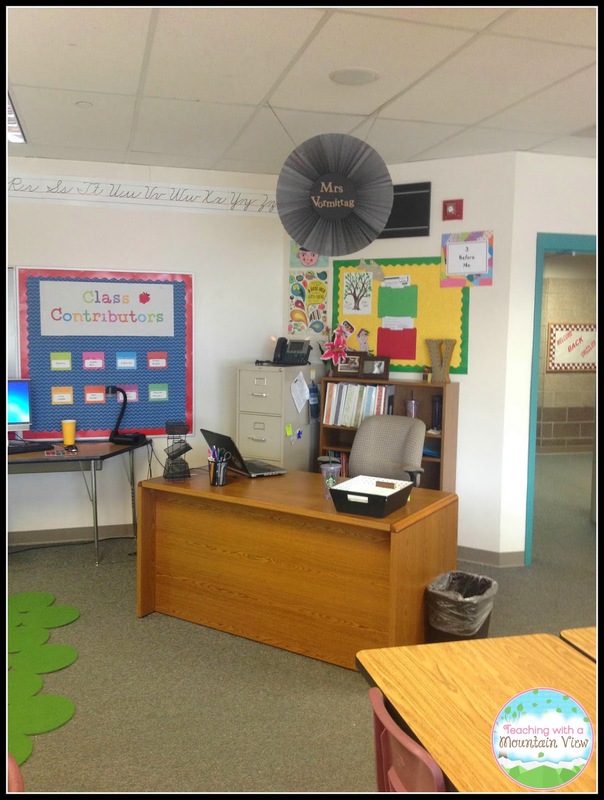 :) Of course, classroom pictures are a bit easier to come by these days with the prevalence of blogs. 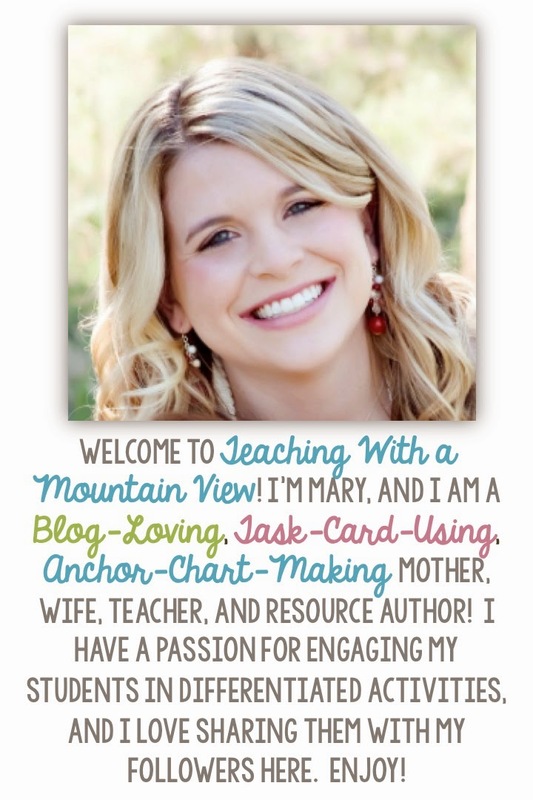 But what about all the teachers out there who don't have a blog?! There are MILLIONS of classrooms out there! 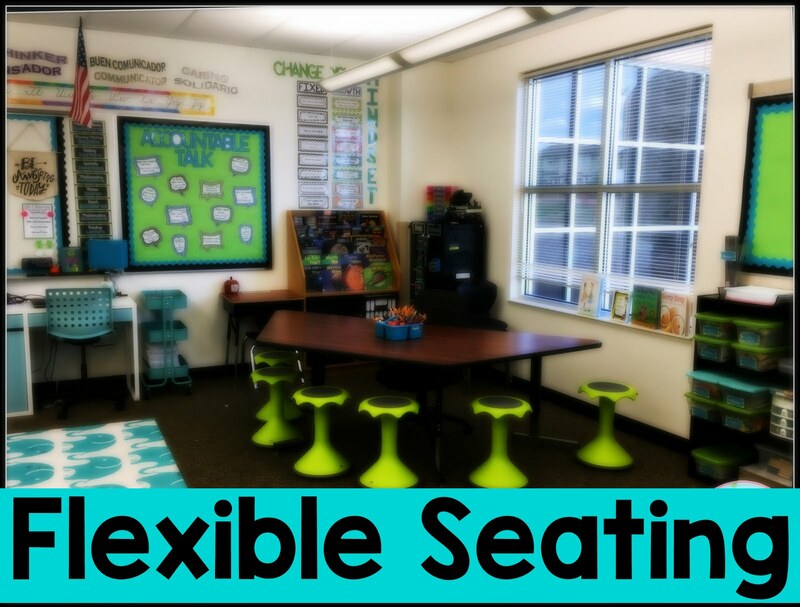 They still have wonderful spaces to share, so Peek of the Week is the place to do this. 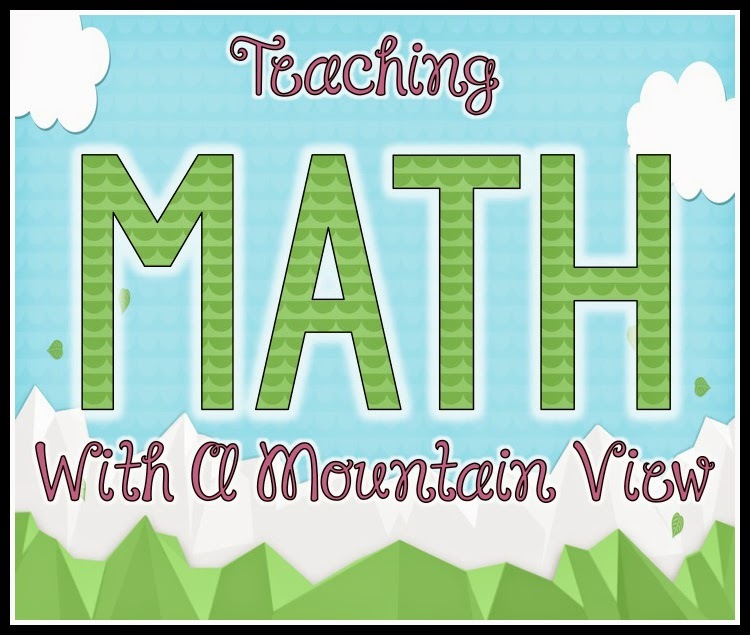 To get started, I contacted several of my teacher friends from around Colorado and asked them to be my guinea pigs. I asked them to take pictures of their classrooms, no frills needed. I told them not to clean up and asked them to not change anything in their room on account of my asking them to take pictures. 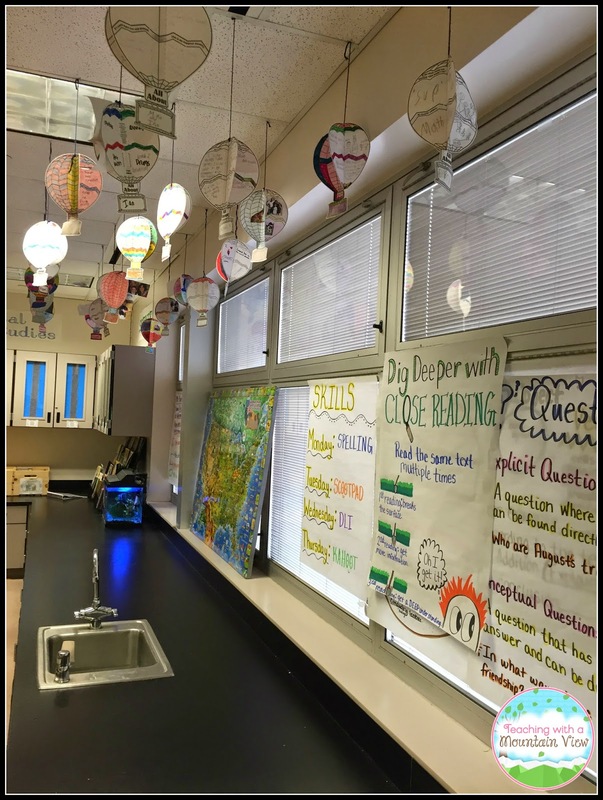 The point of this feature is to show off REAL classrooms in whatever state they may be in and to let other teachers look around for inspiration and to pick up an idea or two. I also told them that I would love to see pictures of their room throughout the year, whether it was at the beginning of the year, or pictures of special activities they did. 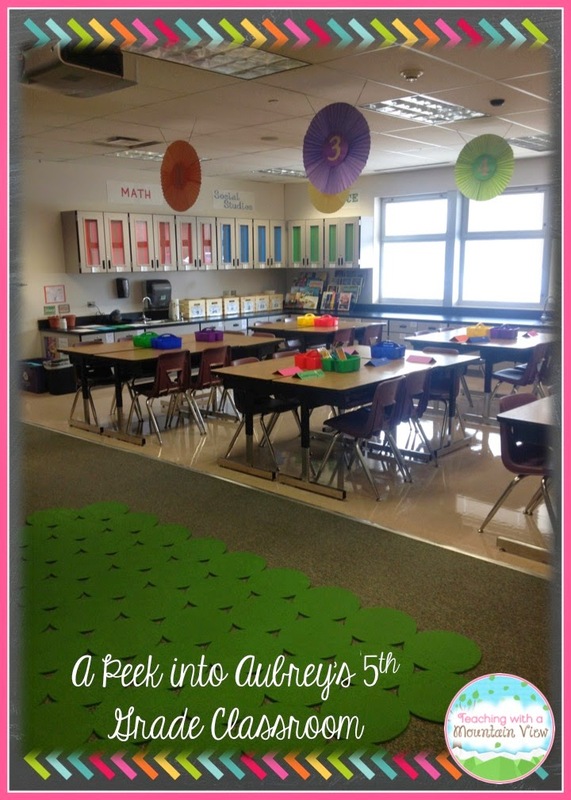 So, without further ado, I present to you your very first Peek from Aubrey, a 5th grade teacher in Denver who has an eye for art and such a lovely colorful classroom. 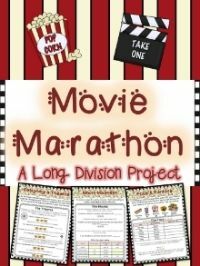 She shared some great ideas from throughout the year in her classroom that I hope you love, too! I love how she has color coded her cabinets for supplies. It brightens up the whole room, and that rug is so fun and functional! This is Aubrey's Accountable Talk white board. 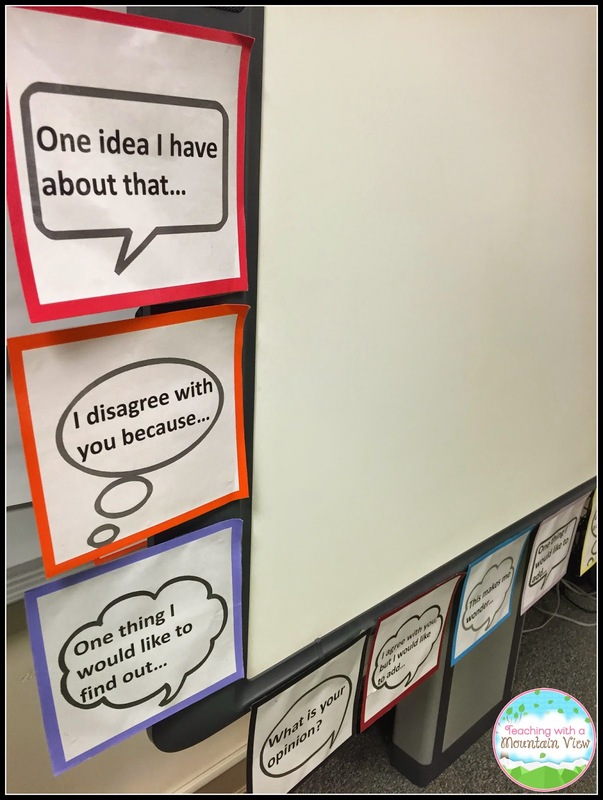 She said, "In my class I use accountable talk. 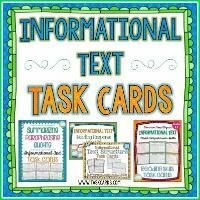 This helps students answer in complete sentences and establishes a norm on an effective conversation. 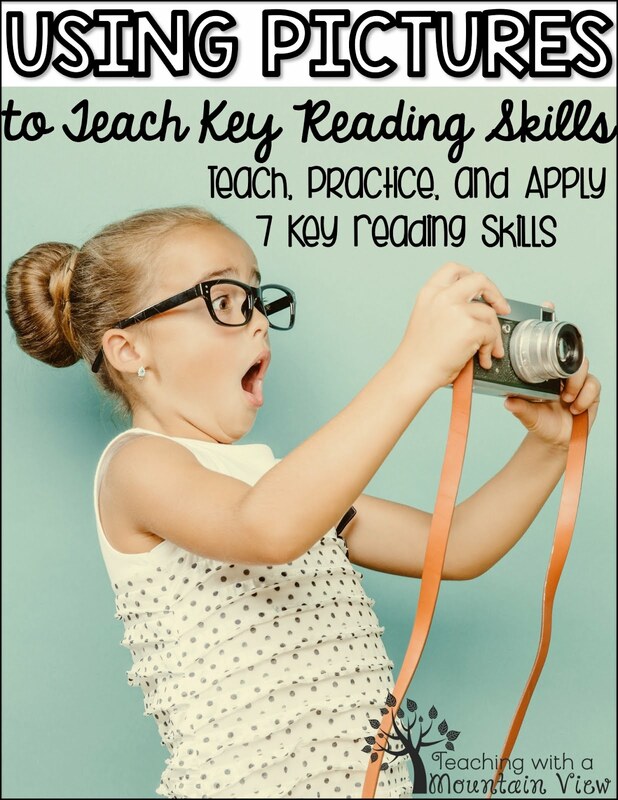 I also helps with academic language." What a great use of the space around her board! Aubrey called these "Bloom Balls." 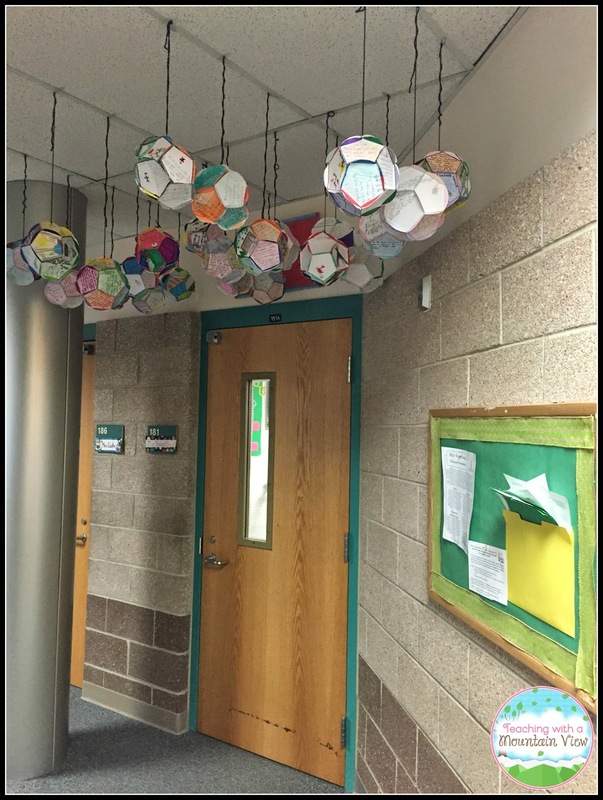 She said, "We also did Bloom Balls for one of my literacy units and they can really fit anything. They turned out so terrific I hung them outside my door." I found a site that has the bloom ball template HERE. They are so beautiful while still being a meaningful activity! 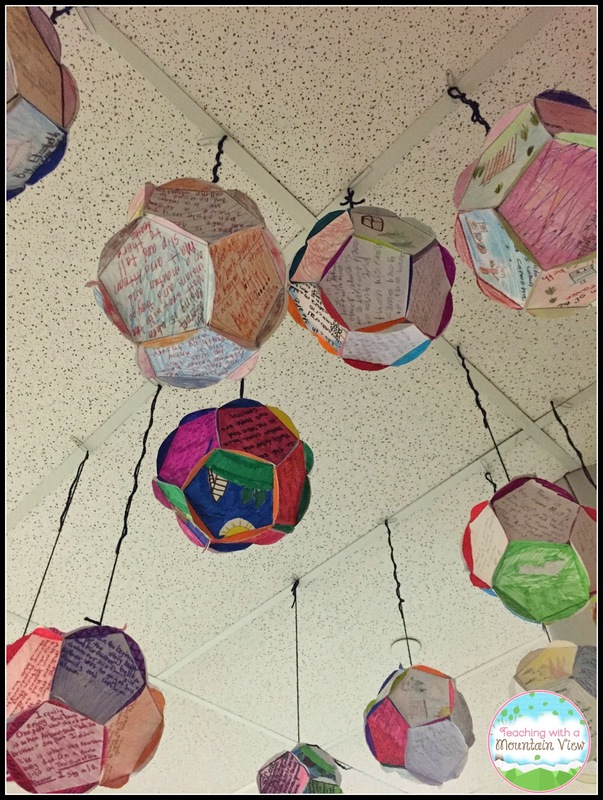 Aubrey's class made these All About Me Hot Air Balloons at the beginning of the school year. 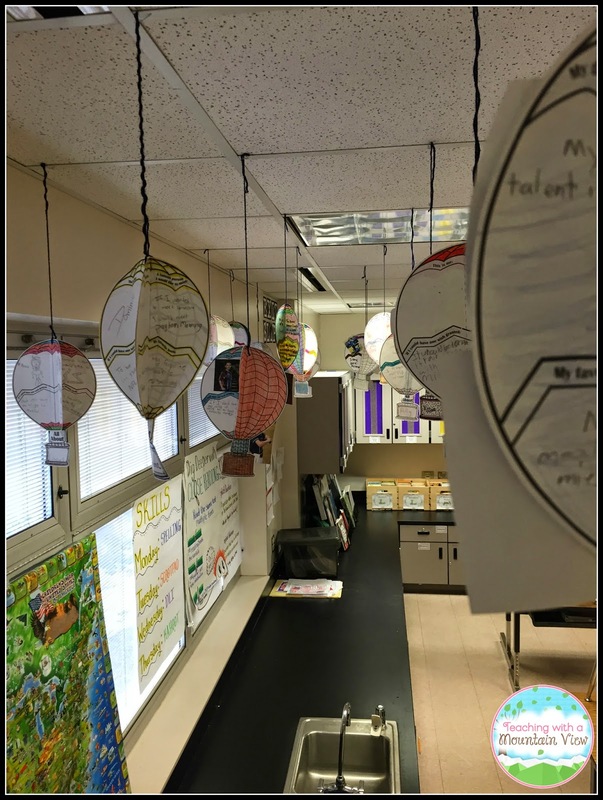 She said, "We made hot air balloons the first week of school. 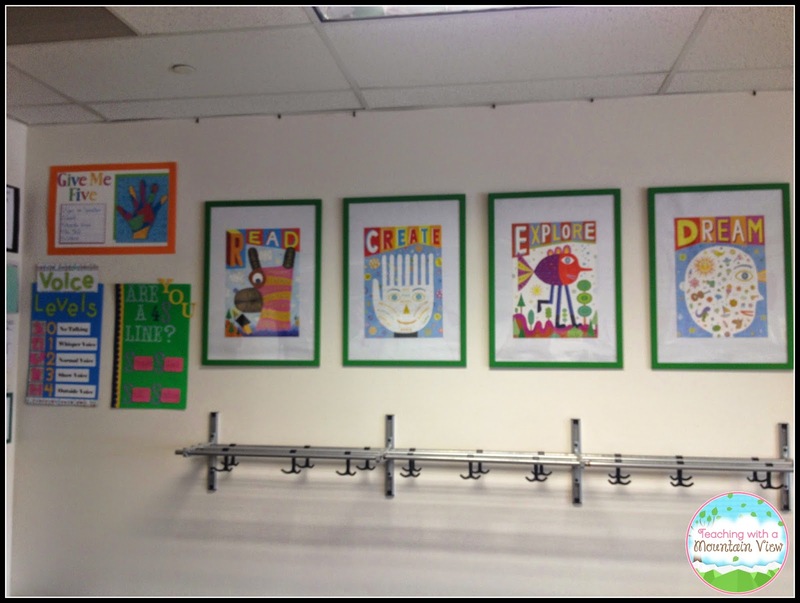 I hung them in my classroom and didn't take them down because my students honestly wanted to be part of the classroom. 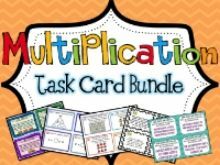 Super easy yet promotes classroom culture." Aubrey got the templates for this activity from Really Good Stuff. 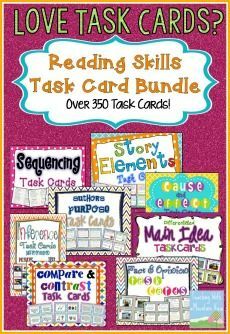 I love this alternative to Classroom Jobs! She has a "Class Contributors" board with the classroom responsibilities. 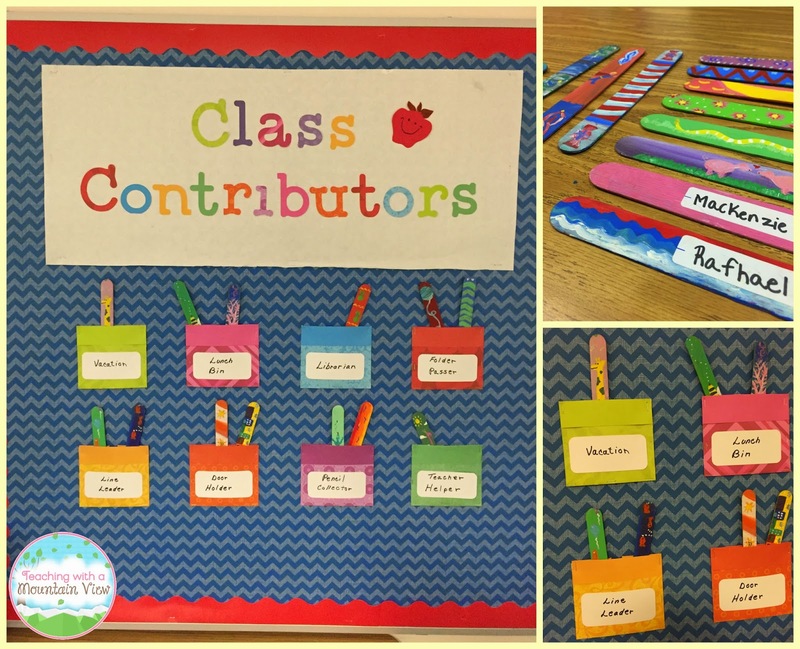 "Over the summer I painted popsicle sticks with different things and my students got to select one and put their name on it. Fun activity to get to know their personality. I use these popsicle sticks for sorting class jobs." Right away, I noticed the sign that says "Silly Goo No Tissue"! I had to ask her what it meant, and she explained that her kids were always trying to throw used tissues into the recycle bin. Eew! We have ALL been there before. 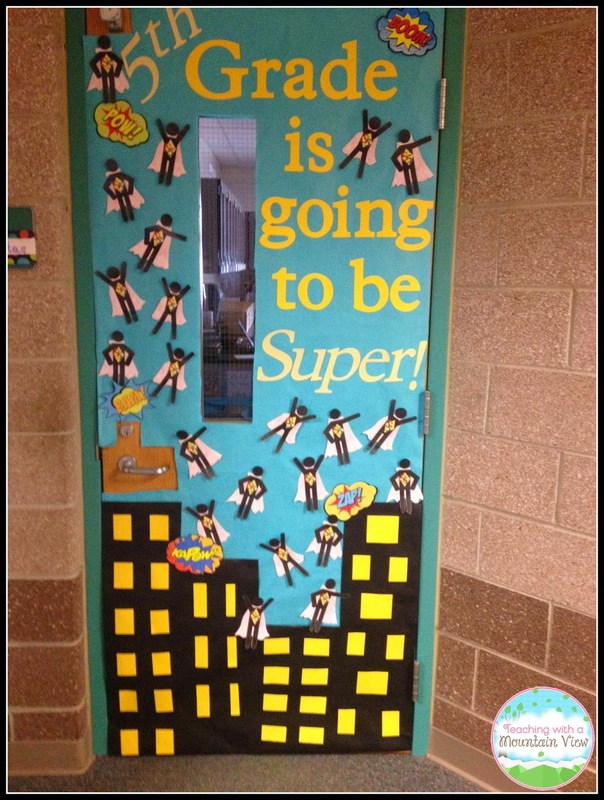 How much fun are these classroom doors!? The first one was from the beginning of the school year and the second from Thanksgiving. She is SO creative. 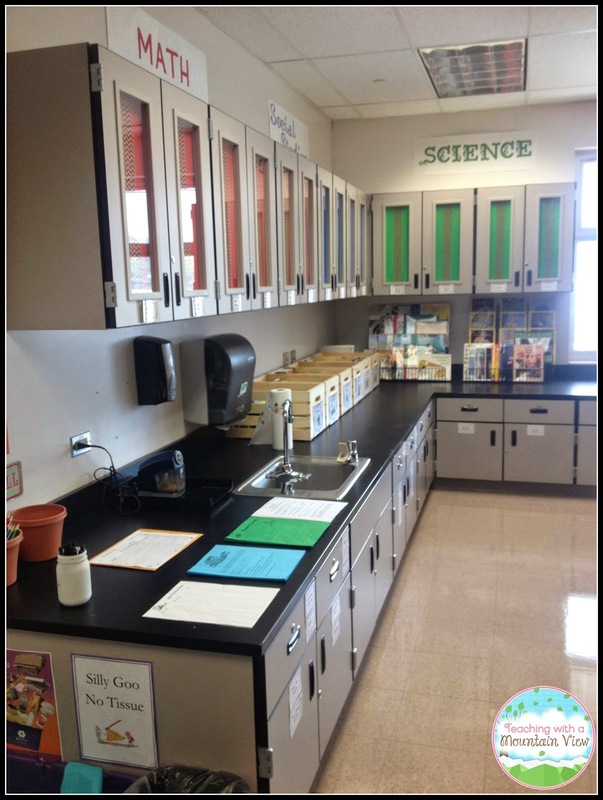 Thank you, Aubrey, for letting me share pictures of your beautiful classroom! What a beautiful classroom. I love the "touch of rainbow" theme that Aubrey has going on. It is subtle but it makes a huge impact. Those cupboards... to die for!! Absolutely gorgeous classroom! Love the Accountable Talk questions around the whiteboard!! 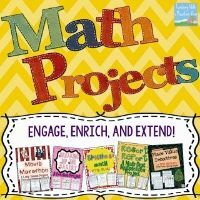 I love this idea too! 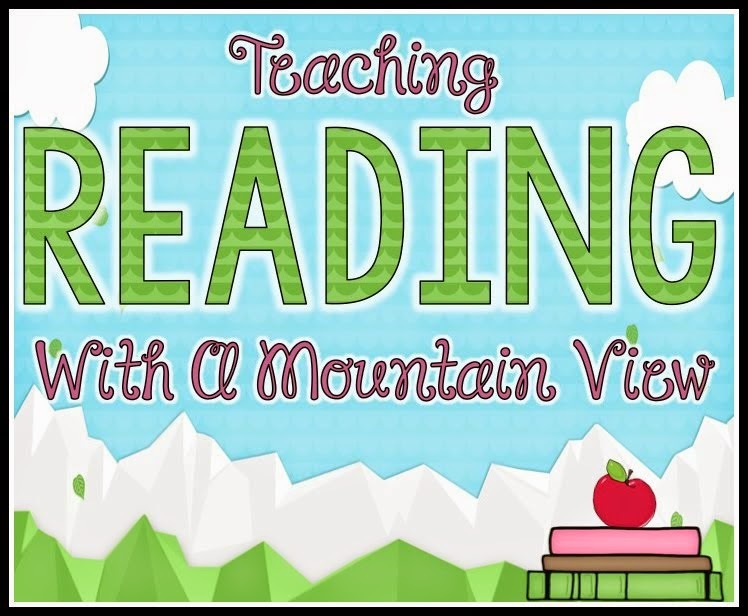 I'll be checking back soon to see other classrooms. 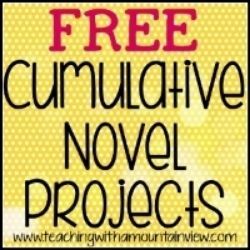 I just linked up your blog to mine so hopefully you will get some traffic! 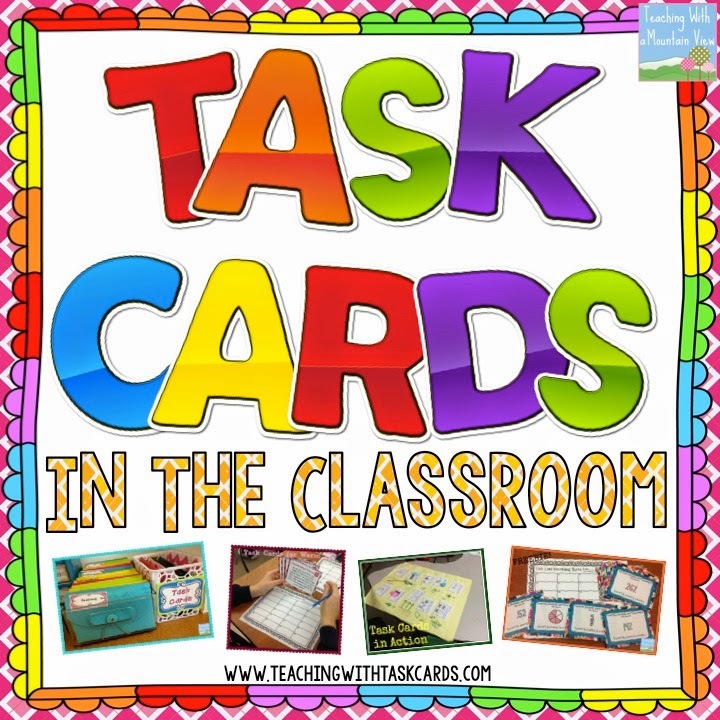 :) I absolutely LOVE your task cards. 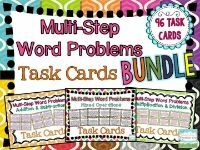 I just downloaded some this morning and plan on using them after spring break! Thanks for all your hard work! Where did she get the rug? Love it! Where is the awesome rug from?